This is a UPS designed for use in an outdoor cabinet. This a specialized UPS, designed for temperature extremes and dry-contact annunciation. Relative Humidity up to 95 % non-condensing. Dimensions 5.5 x 6 x 8.0 inches (140 x 152 x 203 mm). Batteries used: Cyclon severe service lead acid, or BB sealed lead acid. The battery is external to the UPS. Waveform: Sinewave on-line, modified step-wave on inverter. Annunciation: Dry contact terminals for UPS Mode, Low Battery, and UPS Fail. 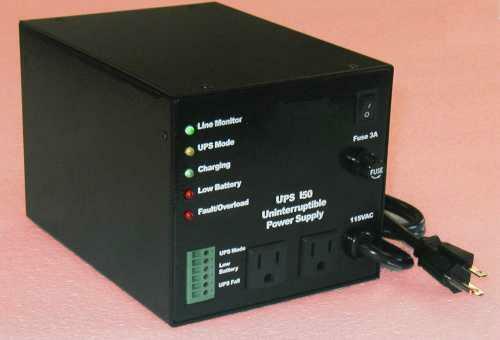 For highest reliability this is a standby UPS--the power components are not exercised unless the AC power fails.